HNL markets a full range of Hygrometers using state-of-the-art electronics to the standards & specifications of MOISTURE SENSORS. They incorporate the most accepted & highly reliable, accurate, fast, stable and long life SENSORS having unique AUTOMATIC calibration feature and are equipped with Single or Dual Alarms, adjustable over the complete range. 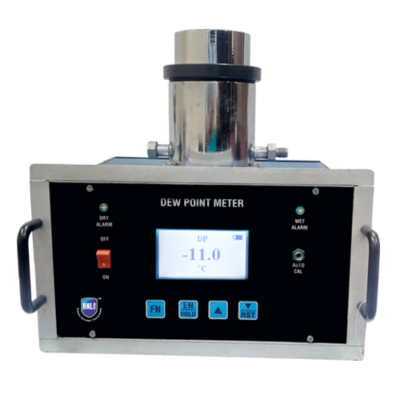 They are ideal for rapid check or continuous online analysis of Dew Point or moisture content of air or gas in dryers or industrial processes. The most important feature of the Sensors system is the automatic calibration facility. Each sensor is precisely manufactured so as to saturate with water vapor at its design maximum. Hence when the sensor is exposed to moisture above its maximum operating range, it will rapidly come into equilibrium at its design maximum and cease to respond to any further moisture. This forms the basis of automatic calibration. The sensor can be calibrated by simply exposing the sensor to an atmosphere which is “wetter” than the operating range of the sensor (Room Air is sufficient) and adjusting the calibration control on the front panel of the instrument to display the maximum range. The sensor is Recalibrated and ready to use. Re-calibrations can be carried out in-situ and without taking recourse to any special equipment or skilled personnel. The net result is reduced downtime. Minimum calibration costs & immediate verification of the system.